Several things made this a great day. The weather was spectacular–not too hot, not too cold, bright, fresh, the kind of day that brings folks to Maine and brings them back again. Also, we got a LOT done. The day before, I had worked with two adults to set out similar experiments in my hometown of Gouldsboro. It took us a good bit of time. But with all of these students digging, attaching nets, running for supplies, and measuring, the work went quickly. Equally important, we had a great time being with each other. But what was MOST important was that the work reminded me that amazing things happen when adults believe that young people can think, take responsibility, and do meaningful work. This should be happening every day, in every school. It’s not. So, I want to share a bit about what I saw in a place where it DOES happen. But, I should begin by saying a few things about the work that the students were doing. Previous posts on this site describe the work that I am doing with teachers and students in my role as Education Research Director at the Schoodic Institute to help Maine towns manage their softshell clam fisheries. My last post was back in November–way too long ago–and since that time the students at Sumner High School and I have refined our thinking about the kinds of data that towns need. This spring we presented that thinking at the Maine Fishermen’s Forum (MFF). Below is a picture of Sumner students at the MFF explaining about the project to the many fishermen, state and town officials, and others who were there. What we learned was that Gouldsboro, our local town, was investing a good bit of money and time from fishermen in putting seed clams onto flats and in protecting those clams with nets. They were doing this in just a few areas where they had reason to believe that the investment of time and money would pay off, but there were many other coves and bays in Gouldsboro that had once been productive, years ago, but were now considered to be “dead mud.” Research by Brian Beal (of the Downeast Institute) and others strongly suggests that this “dead mud” might be productive once again if it were protected with nets and in other ways to keep predators from devouring all the clams during their first years of life. However, a large barrier to such fishery restoration is its cost in terms of money and effort. It is much too expensive to deploy on a hit or miss basis. This suggested to us that Gouldsboro and other towns could make good use a “lightweight,” easy to deploy way to figure out which bays and coves were likely to be most productive. We also learned that the Downeast Institute had already developed a number of ways to collect answers to key questions such as (1) how fast do clams grow in an area? ; (2) how much new clam recruitment is happening in each place? ; and (3) in which areas is predation pressure the greatest? 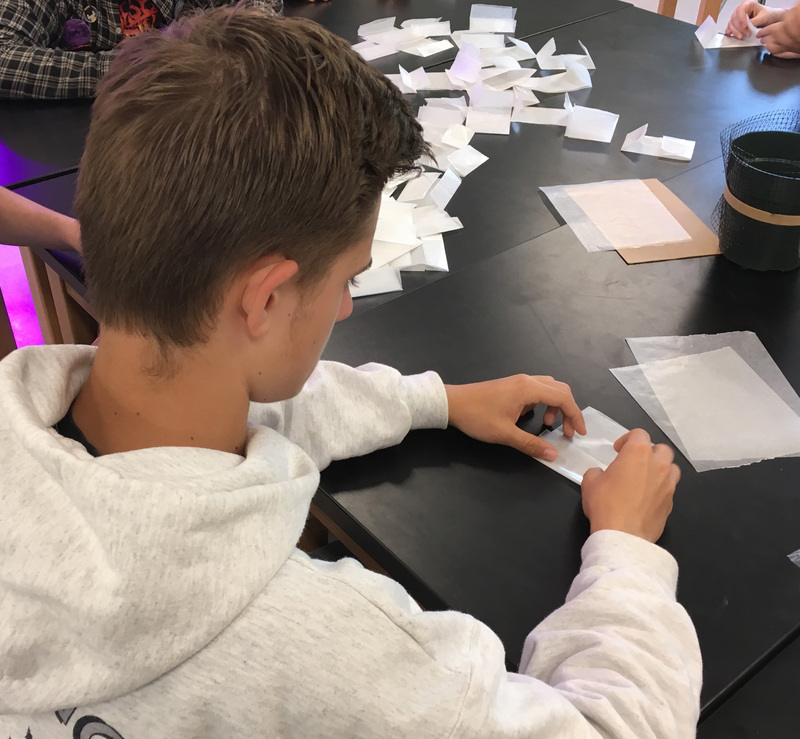 CSI-Maine was why I was at the Edna Drinkwater School to work with the science teacher, John Van Dis, and his students to set things up so that they will have results to analyze this fall. Hannah Raymond, of the Tanglewood 4-H Center, joined us to help with the digging and to find out more about the project so that she and others at Tanglewood (which is only about 10 miles from the school) can assist the students next year. Just as I was heading out the door of the school’s main office, after signing in as a visitor, a student popped into the office quickly to check on something and then headed back down the hall. He turned around and asked, “Are you Bill?” I answered that I was, and the student introduced himself and said that he would be working with me later in the morning and then directed me to Mr. Van Dis’s room. I have the privilege of spending a fair amount of time in different schools and different classrooms, sometimes as part of my work with the CSI-Maine initiative and sometimes as part of my work as a program evaluator for other projects. I have learned that it is a good sign when students make eye contact, smile, and acknowledge my presence. It seems to say a lot about how students perceive adults, and how adults perceive students in a particular classroom or school. If students make eye contact and say “Hi,” it suggests that at least some of them see adults as people who might have interesting things to share, and I have learned that this usually means that there are some adults around that see students the same way. When I arrived in John’s classroom the students were waiting for me and ready to go to work. This was a class of about a dozen eighth-grade students. It was still about 3 hours before low-tide, but we had plenty to do. We would be placing a dozen juvenile clams into each of 36 six-inch plastic flower pots that would be filled with mud and buried on clam flat with only the rim of the pot showing. It is impossible to accurately separate live clams from dead ones and count them out, twelve to a pot, out on the clam flat. So, these students prepared 36 wax paper packets, each with 12 live clams, that could be emptied on top the pots once they were buried. One of the wonderful things about working with students this age is that they are a mixture of “grown up” and “kid.” I drew a diagram of the experimental design that the sixth and seventh-grade students would be setting up in the field and, as I did that, a number of students asked questions that showed that they were not only listening, but that they were thinking through the design as they listened. The questions evidenced a good understanding of experimental controls, independent variables, and dependent variables as well as experience (and comfort) with raising critical questions. But those critical faculties did not prevent the students from talking to the juvenile clams, naming them, and making up outrageous stories about them What fun! Adults should do more of this. Once we had the 36 packets of clams (plus a few extra), we took a walk through the forest on the school’s grounds to the shore and mudflat, which is also on school property (Wow!). It was nice to see that there was nothing unusual about walking down to the water. There was none of the horsing around and sudden release of energy (We’re free!) that I sometimes see with students who rarely get outside. It was clear that these students frequently do their learning outside and that they like it. Once on the shore, I could see that the tide was now out enough to permit us to come back with our gear and begin to install the experimental plots at the upper end of the tidal range. So, we headed back up to the school. John had arranged with the math teacher (who would normally have sixth-grade students while John was teaching science to seventh-grade students) to combine the sixth and seventh-grade sections in order to give us two consecutive class periods out in the mud. While John was making those arrangements, Hannah and I had brought all the gear to the back door of the school. It wasn’t long before we all had boots on and students were carrying the fish totes loaded with flower pots, trowels, nets, rubber bands, measuring tape, GPS devices, and the cooler full of juvenile clams down to the shore. We quickly laid three one-meter quadrats along a line that was just below the point where the rocks and gravel stopped and the mud began. I gathered the students around me and showed how to dig a hole in the mud, using some of the mud to fill the flower pot and then putting a layer of soft mud on top — soft enough for juvenile clams the size of pumpkin seed to burrow into. I asked a student to hand me a packet of clams, placed them on top of the mud, gently pressed them into the mud, and then covered the whole thing with a net secured with a large rubber band. I then showed how to place the pot into the mud so that only its rim showed. I explained that there would be 4 pots in each quadrat and that two would be covered by a net and the other two would be uncovered. I asked if there were any questions. There weren’t any, so I pointed to the trowels and the pile of pots and asked the students to take over. Here’s another thing that impressed me about these students. One boy quickly grabbed a pot and trowel and began digging a hole across from the pot I had placed. That’s not usual. Also not unusual was that, once he had spread soft mud over the top of the pot as I had demonstrated, he found himself kneeling in the mud, with muddy hands, and without clams, a net, or a rubber band to fasten the net — but surrounded by onlookers. I suggested to the others that they should divide into teams with someone doing the digging and with others doing the running to make sure that the person in the mud had what he or she needed. The unusual thing was that these students instantly got this and knew how to do it. Without further instruction from adults, they organized themselves, dividing up and sometimes trading off responsibilities. Like walking through the woods and learning outside, working in teams was clearly something that these students had done before and knew how to do. 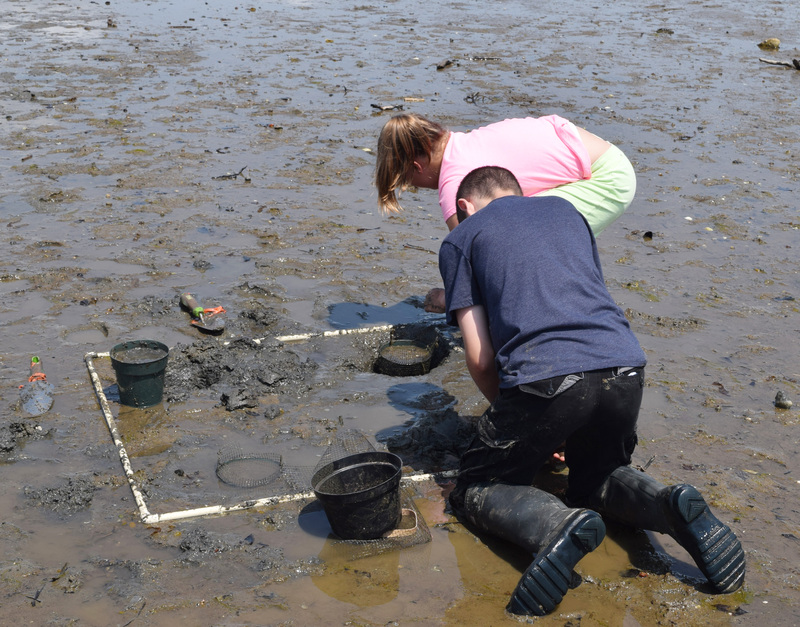 They quickly had all the experimental units placed along the first, highest transect and were ready to move further down the mudflat to a second transect. The students took a lunch break and, when they came back at 12:30, the tide was fully out. On that day the low tide was actually expected to be at the mean low tide level, enabling us to take a GPS reading that positioned the average low tide for that cove. As we finished putting in the experimental units at the final, lowest transect, some students took the opportunity to explore the large new world revealed by the receded ocean, others continued to be engaged, heads down, in wrapping up the work. 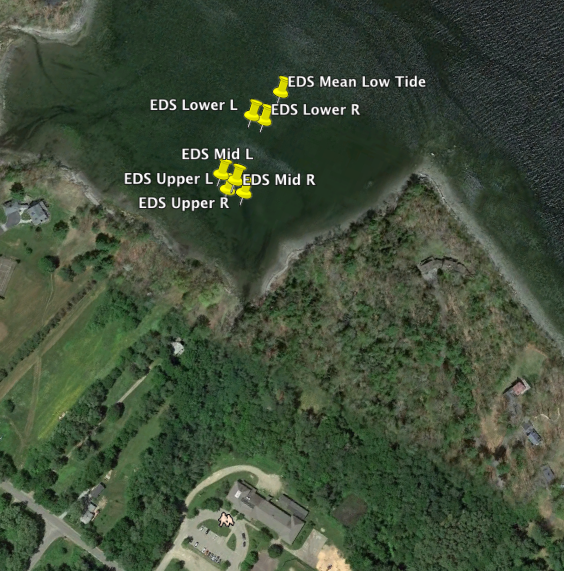 Below is a screenshot from Google Earth that shows the ends of each of our three transects, along with our estimate of the mean low tide location. The school building is toward the bottom of the picture. The students helped collect all the gear. I was pleased to have all the trowels and quadrats washed clean of mud before they were returned, all without my asking the students to do that. The students wanted to carry everything back up to the shoreline; I got to walk empty-handed. Nice. Once we were back up on the shore, John, the teacher, gathered the students into a circle and gave them the opportunity to reflect on the day’s work. Again, I have the opportunity to observe a lot of teachers and students and have become aware that, sometimes, when students are asked to reflect on a class or on an experience, their reflections seem to me to be framed in terms of what they think the teacher wants them to talk about. Often this framing of the discourse becomes even more evident as the teacher offers verbal rewards to students who offer particular kinds of observations. Other times, and this was one of those other times, students seem to talk honestly about how they felt, what they liked, or what stood out for them and the teacher just listens and they listen and respond to each other. Some of the students showed things that they had found. One boy found a worn, partially round, toothed wood object that appeared to be one part of what had once been a wooden gear. Years ago there had been a mill not far from this cove. Perhaps it had come from there? A girl had found a piece of frosted glass that, surprisingly, had a red, five-pointed star at its center. Others had found shells that they would take back to class to identify. Other students said they liked being outdoors on such a beautiful spring day. All of the students agreed that they really liked the soft mud that they spread on top of the pots to make a bed for the juvenile clams. Playing in mud! They liked the little clams. They looked forward to finding out what would happen to them. There was some talk about how many would be eaten by crabs and milky ribbon worms. They liked finding razor clams. Toward the end of this sharing out, a boy took the floor in a way that suggested that he wanted to say something complicated and had not quite figured out how to put it into words. He said that he had never done anything like this before. He really liked setting up the pots and putting them in the mud. He liked the idea that we had spread the experiments over the whole clam flat. He liked knowing that he would come back next fall to find out what happened. He liked the idea that this was something that other people, grown-ups, wanted to know more about. The students that I worked with this past year were high school students, and I was not sure whether middle school students, particularly sixth-grade students, would be able to handle the physical demands of the CSI-Maine fieldwork. I also wondered whether they would have the attention span and focus required to work carefully, following protocols and setting up a good experiment. Now I know, yep, they can do it, and do it all really well. 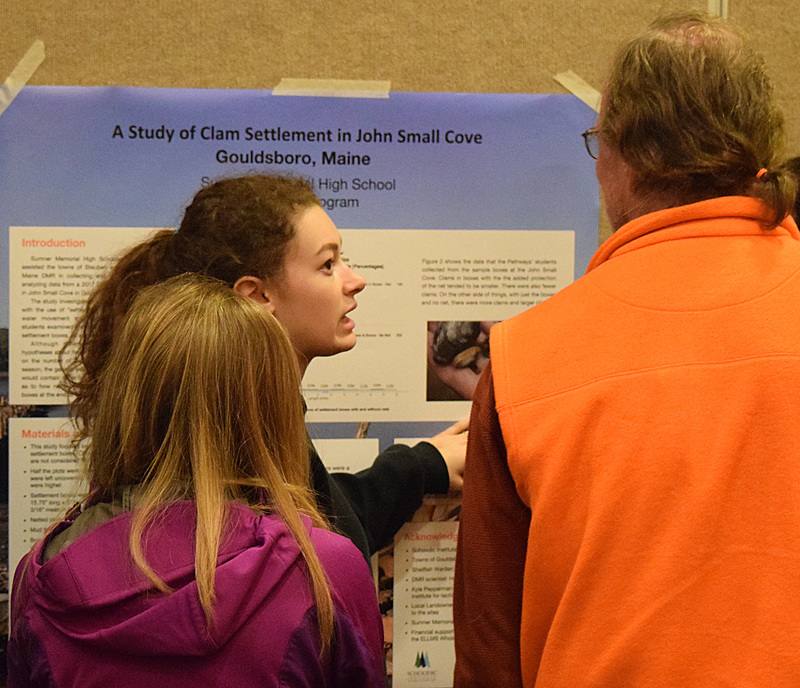 Another thing that occurred to me was that often, when I talk about CSI-Maine, I talk in terms of concepts and ideas, such as the idea of connecting schools and kids to the places where they live, or the idea of engaging kids in authentic scientific work. It is important that I do those things and I understand why that is so, and I truly do believe that connecting students to science and to where they live is important to sustaining rural communities. But, as important as such things are, the fieldwork last week reminded me that what really excites me about this kind of teaching and learning is the response I see from the kids. This kind of opportunity makes a difference for them, and that is what makes a difference for me. Yes, it is my job to figure out just WHAT makes a difference and HOW it makes a difference — but, most days, I am just happy to see it happen. Finally, I recognize that what I witnessed that day was made possible by a good teacher, working in a supportive school, who has helped his students work in teams, believe in their own abilities, express their thinking, learn about experimental design, and more. The work I do in schools had made me aware that such support systems for students are less common than I would hope. Past posts on this blog have puzzled about why that is so and how we might change it, as will future posts. In this post, I will just say that I think part of the problem is that we (this includes me and many well-meaning teachers) often underestimate what students are capable of doing once they know that someone believes in their capabilities and provides them with a safe place to try things, make mistakes, and learn. The really great thing about the work we did on Wednesday of last week is that I was able to see such learning in action and was reminded, once again, of what is possible. This entry was posted in Authentic Science in Schools, CSI-Maine and tagged Authentic Learning, Citizen Science, Clams, science teaching. Bookmark the permalink.